I swear none of you have ever seen anything like it before! These characters live their complicated lives in the DS and you will intervene with the power of the dead for a possible different outcome of fate. Isn’t it exciting? I did try out 3DS at E3 and I was flabbergasted to the 3D technology as a long standing fan of the idea since the days of Virtual Boy. I’d love to see GTPD in 3D but… you know what you have to do for that to come true! Yes, we do! And if the present excitement is anything to judge by, we're sure that Capcom will have no problem selling enough copies to justify future instalments. Why not fuel your own interest and read the full interview now? Also, in a different interview, he states that the Ace Attorney games may be through! However, he says that they'll take their new ideas to the 3DS, so there's always a possibility of a continuation. He also discusses how his inspiration for the games came from novels that he read as a boy. Why not read it for yourself? No more Ace Attorney games? Sweet! And Ghost Trick looks pretty good, now that I've taken a gander at it. Might consider picking it up now. Ghost Trick looks and sounds promising, but no more Phoenix Wright? OBJECTION! @theblackdragon Well, he considers it finished, which sounds more theoretical than definitive. Like it just feels finished, though who knows what will happen. @3 investigations a disappointment?!? It was my favourite game in the series. Apollo justice easily being my least favourite. Investigations at least tried to reinvigorate a dead horse, which the series had become by the time we reached Apollo, I love the storyline but there was so much wrong with the point'n' click model of the first 4 games that shows it age now. Everything else from the games was excellent, but the seriously poor "gameplay" outside of courtroom is appalling, and AAI improved on it significantly while keeping everything good from the previous games, and improving on it significantly. Examining crime scenes as Edgeworth makes much more sense as to how you go about it than how phoenix did it, "logic" could use improvement to include using evidence and possibly profiles rather than bits of text. The music in Edgeworth, I thought at least, was so much better, it did an amazing job of using the DS hardware, at least in comparison to the first 4, and I definitely prefer the main themes from AAI (like cornered and objection) to some of the other entries, except maybe the themes from the first game. Also, capcom obviously doesn't care if he thinks the Ace attorney series are over with or not, since they already released AAI without him. Perhaps he considers Ace Attorney and Ace Attorney Investigations different series? @Linkstrikesback: The cases were boring, the 'logic' system was far too easy to use, and the fact that they chose to focus on political intrigue rather than what was going on between the characters themselves (as they've done in every other AA game) really makes it hard to show any kind of affection for this game. It relied on cheap cameos to keep people going, and it took me weeks to force myself through that long final case just because it had me bored to tears. IMO, Investigations was a steaming load of crap, and I hope like hell they choose to go back to the tried-and-true point-and-click style the first four games had if they make any other AA games at all. No more PW? That makes no sense. Apollo Justice had a cliffhanger ending. NOOOOO!!!!! NO MORE ACE ATTORNEY?!?!?!??! It's possible that he meant that there would be no more Ace Attorneys after Apollo Justice, instead of no more Ace Attorney games after Ace Attorney: Apollo Justice. @tbd: You actually finished Investigations? That's more than I can say. More Ace Attorney would be great provided they get the gameplay more towards the first four, IMO. It's funny that I don't think I actually hate Investigations as much as tbd, yet she finished it and I didn't. The power of distraction, I guess. But really, it's easily the weakest entry in the series. I barely finished AAI. If Ace Attorney is going down that route, then please, keep it finished. 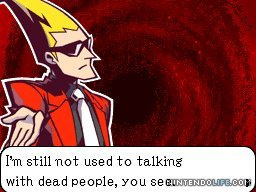 But if we can go back to the awesomeness of Trials and Tribulations and Apollo Justice (I prefer PW over AJ) then please do after Ghost Trick. Can't wait to play Ghost Trick. No more Ace Attorney!? Nooooo! I like the look of this game though! These comments don't have much to do with the game this articles about. Ghost Trick looks cool but no more Ace Attorney? OBJECTION!! THAT'S JUST NOT RIGHT! So what happened to that bright outlook on sales numbers?